I'm here in transit to and fro my dream fjord: Geirangerfjord. By land it takes 2 days to get there and back at least. There's nothing of interest to this town, Åndalsnes, but it's set in some nice hills and snow patched mountains are in view. It's probably great for some steep hiking, but I'm relaxing along side the lake where the washed up seaweed pops like packing bubbles and the clear/red jellyfish pulsate in at the waters edge. The bubbling in the water deserved a closer inspection. Hoping to find some small exotic creature, I saw what was happening was the tide was coming in and you could see it rising over stones by the second. The seaweed had only been temporarily washed ashore. I can also see small shrimp like things. There are no waves or traces of salt, yet the life there is appears to be of the sea. 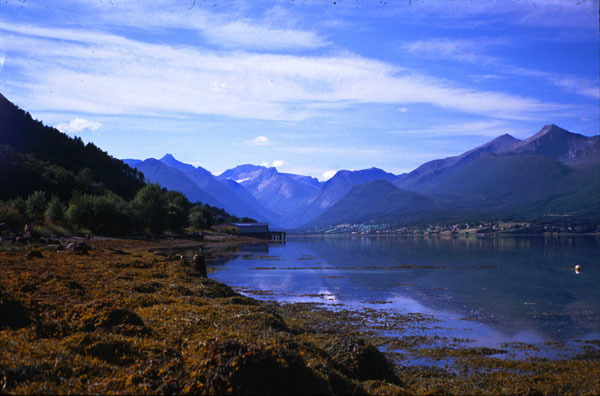 The connection of fjord and sea is still sinking in.